That mankind plays a role in global warming, we do not argue. But there are renowned scientists who are sceptical. We think humans, may contribute to global warming by their well-known activities. On the other hand, however, humans do efforts, probably also secret efforts to combat global warming. Some great scholars allow they are puzzled by global warming. For prehistoric climate changes they always had an explanation: it was a comet, a volcanic eruption, the axis of the earth, the power of the sun … Now models point to global cooling and yet earth is warming up. So humans must be the culprits. Certain is that only a fraction of carbon dioxide contributes to greenhouse gases. Atmosphere exists about some 0.037 percent of carbon dioxide, a record over the last millions of years, a depth record. 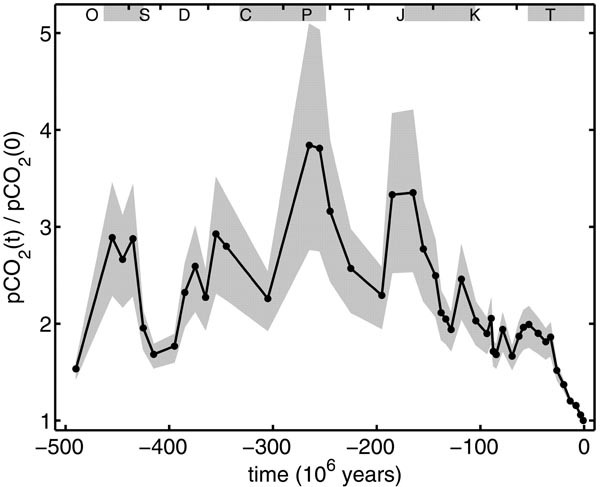 An overview of the CO2 content during the last 500 million years (source: Rothman http://www.pnas.org/content/99/7/4167.full). Water vapor is the major supplier with an average of two percent of greenhouse gases. Logical, since the Earth is nearly completely covered with water. A small global temperature rise however, could start a chain reaction and contribute more and more to greenhouse gases (especially by evaporation of oceans). More warming, more greenhouse gases, and so on. Things the media seem to be ignoring. Update December 2015: Sorry the link http://www.diviner.ucla.edu/docs/2650.pdf is not giving us the original explanation anymore. Though it was a very good article. So we give you another link that could explain a lot. Strange that suddenly they find reasons why other planets and moons in our solar system seem to be warming up. Or they find reasons to claim there is a kind of misunderstanding. But about our moon they remain very silent. Although they undoubtedly follow for many, many years the evolution of the temperature on the moon. Many say planet X is the real culprit of global warming and we believe they are right. The uncountable articles about the issue on the internet are surely not all fake news. Agreed: there could be an explanation not related to the existence of a yet unknown planet, but the yes/no discussion is already in place. That makes us suspicious. As you know casting doubt is a very good helper to hide the truth. For twenty years Nobel prize winner Paul Crutzen and others are saying that sulphur in the atmosphere could stop global warming. Are chemtrails really formed by sulphur? We don't know for sure (as usual). But we are convinced of the fact that our real leaders are geoengeneering for decades already and in the mean time are taking global warming as a means of sensitizing people and creating economic growth that will benefit mankind in more than one way.